1. What are insulating concrete forms? 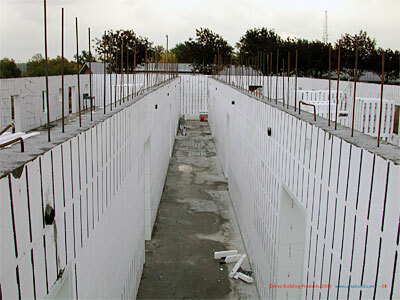 ICFs are hollow “blocks” or “panels” made of plastic foam that construction crews stack into the shape of the walls of a building. The workers then fill the center with reinforced concrete to create the structure. There are over 20 brands of ICFs in North America, each with some variations in design and materials. ICF construction sandwiches a heavy, high-strength material (reinforced concrete) between two layers of a light, high-insulation one (foam). This combination creates a wall with an unusually good combination of desirable properties: air tightness, strength, sound attenuation, insulation, and mass. 2. Do the ICF forms stay in place after the concrete is poured? Yes. 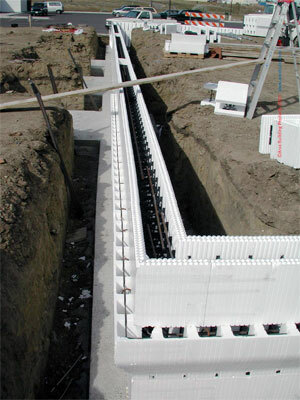 ICF forms are used to allow builders to pour a solid concrete wall. However, upon completion, the forms are designed to provide insulation, nailing surfaces, and a vapor barrier all in one step. 3. Are there different types of ICFs? There are three different types of configurations: 1) flat wall, 2) waffle-grid, and 3) screen-grid. 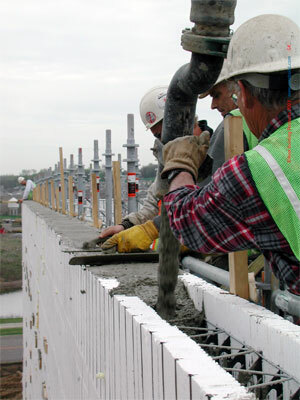 Flat wall systems yield a continuous thickness of concrete, like a conventional poured wall. Grid wall systems have a waffle pattern where the concrete is thicker at some points than others. Screen grid systems have widely spaced horizontal and vertical columns of concrete, which are completely encapsulated in foam. Whatever the differences among ICF brands, all major ICF systems are engineer-designed, code-accepted, and field-proven. 4. 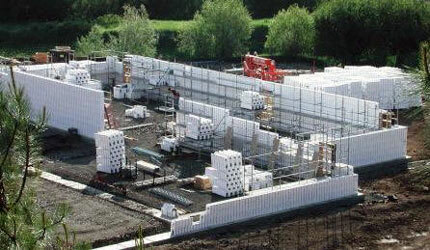 What is the best ICF? Although some ICF installers have personal preferences, the real question that should be asked is, "What ICF will suit my needs the best?" It is obvious that each individual ICF building system has different properties that deliver different benefits to the end user. Some have thicker insulation than others. Some are connected with metal ties, others with plastic ties. Some systems are stacked like building blocks, others require assembly. Whichever the system, it is important to note that once the ICF home has been correctly installed and the concrete cures, you will be extremely happy with your ICF home. In picking a system, there are many issues to consider. If installing the system yourself, does the company have a training course? How easy is the system to install? Does the company have a technical department to address specific design issues? Is the company good about following up on answering questions? What is the company's track record on customer service? What is the price of the form? Will there be on-site support during the installation and pour? How quickly are forms delivered? Will the company offer references in your area? These are just a few of the questions that can be asked. However, not everyone will ask the same questions, mostly because everyone's needs are different. This is why it is crucial that you develop a list ranking your own issues in order of importance. Although it hasn't been mentioned yet, building rapport with the supplier is also critical to the success of the end product. The business relationship you form with the company will last for years, and will impact the end product you receive. Whichever company you pick, it should be one that you feel comfortable with. 5. How tall can ICF walls be built? ICFs have been engineered and built to 48 feet tall (free standing/load bearing). It is important to note that in most applications, ICF projects can be designed using ACI 318 and are designed like any other steel reinforced concrete wall. 6. What are the most typical ICF cavity sizes? Most ICF companies manufacture forms in 4", 6", 8" and 10" cavity widths. However, some systems that use loose connectors can be built in 2" increments up to 24". 7. How much steel reinforcing bar (rebar) do I need? This will be determined by the design parameters of the building, and in accordance with local building codes. Additionally, ICFA sells Prescriptive Method for Insulating Concrete Forms in Residential Construction (2nd Edition) through the bookstore, which provides tables that provide a guideline for most common applications. These can be found in our product manual which can be downloaded from this website. 8. How does one attach Cement Board, vinyl siding, and brick ties to ICFs? Is drywall attached the same way? A metal or plastic flange runs from the top of the form to the bottom, allowing a fastening strip for mechanical attachments, such as exterior siding, brick ties and drywall. The flange is engineered to withstand high pull out stresses and is designed to keep the materials securely attached for decades. In all cases, most exterior and interior cladding can be installed with common attaching screws. 9. Can acrylic finishes and stucco be applied to ICFs? Most acrylic finishing systems are comprised of a reinforced base coat, optional primer and a 100% acrylic polymer finish. Finishes are available in a limitless color selection and offer performance enhancement options. 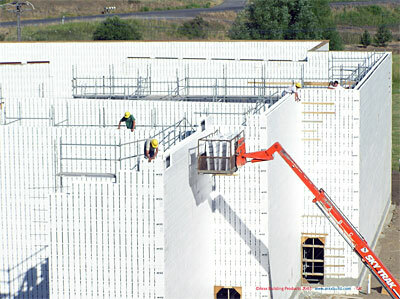 Exterior acrylic systems are perfectly suited to ICFs, as the preparation for applying an acrylic system to the ICF typically requires only rasping the foam before application. If exterior webs/ties are present, an additional layer of 1” thick EPS must be adhered over the ICF prior to application of the acrylic finishing system. Portland cement stucco is also a very durable and can create an endless variety of colors and textures for an exterior of a house or building. When stucco is applied to metal lath, three coats of plaster form a 7/8-inch total thickness. A vapor -permeable, water-resistant building paper separates the plaster and lath from the ICF. It’s a proven system that works in all climates. 10. How are doors and windows installed? A wooden or vinyl buck is built and incorporated into the wall as it is being stacked prior to pouring the concrete. Once the concrete cures, doors and windows are installed as usual. 11. How are utilities installed? The points at which utilities connect to the building should be identified prior to the pour. This will allow for conduits to be placed through the wall so that the utility can enter. Once the concrete is poured and cured, channels or grooves are cut directly into the form using and electric hot knife or router. Plumbing and electrical lines are then inserted into the grooves and covered by drywall. 12. Do the workers have trouble learning something so new and different? Conventional homebuilding crews adapt easily to ICF construction. Stacking blocks is intuitive for most people, and the cutting and leveling involved draw on standard carpentry skills. Most carpentry crews will have to brush up on the use of concrete, and electricians need to learn how to cut channels in the surface of the foam to house their cable. But these are not complex tasks, and there is plenty of help available. Actually, ICF construction has big advantages for the workers. The foam is light, and power equipment moves the concrete. So crews stay fresh and sharp. In fact, the simplicity of assembly and the lightness of the work help keep labor costs below those of frame construction. 13. Is ICF installation training available? Yes. The majority of ICFA Primary members offer training throughout the year. Please review the list of ICFA Primary members at www.forms.org to discuss how you can participate in their training programs. 14. How quiet are ICF walls? An ICF wall has a sound transmission classification of approximately STC 50, which is twice as high as a typical wood-framed wall. Loud noises outside a ICF building will be reduced to a whisper inside the building. 15. How do ICF walls fare with termites and other insects, and even rodents? EPS provides no food value for termites or rodents. Whether wood frame construction or ICFs, local building codes do require methods for protecting foam below-grade in high termite areas, which are specifically outlined in the International Residential Code. The same prevention measures used for wood frame construction can also be used for ICFs. The advantage with ICFs is that the termites can't affect the structural integrity of the building since it is made of concrete. 16. Is a vapor barrier needed on ICF walls? No. The combination of concrete and two layers of foam means that the ICF wall acts as a natural barrier against air and moisture. 17. Are ICF walls waterproofed? As with any form of below-grade construction, waterproofing is required. There are many to pick from that work extremely well. These include latex sprayed waterproofing, peel and stick membranes, as well as dimple board sheets. Always check with the manufacturers specifications to determine whether their waterproofing can be applied to ICFs. 18. Can ICFs be used above grade? Absolutely. The many features and benefits which ICFs provide below-grade make them a perfect choice for above-grade construction. In fact, to receive the full benefit from this type of quality construction and maximize the energy efficiency of the structure, ICF forms should be used for all exterior walls. 19. Are ICF buildings safer than wood-framed buildings? Yes. 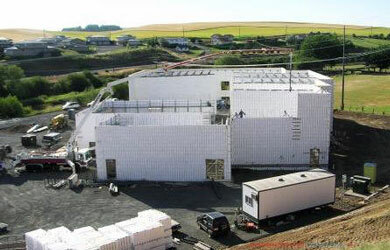 ICF buildings are up to 8.5 times stronger than wood framed buildings. As a result, ICF walls are more able to withstand severe weather such as hurricanes and tornadoes. Most ICF walls have a 2-hour fire rating as opposed to 15 minutes for a comparable wood framed wall. 20. In what ways can the foam of ICFs be protected from termite infestation? The best method to protect against termite infestation is to eradicate the colony and prevent them from setting up shop on your property. The National Pest Management Association recommends preventing termites by “Removing the conducive conditions termites need to survive.” Termites love moisture; avoid moisture accumulation around the foundation of the building. Divert water away with properly functioning downspouts, gutters and splash blocks. Reduce humidity in crawl spaces with proper ventilation. Prevent shrubs, vines and other vegetation from growing over and covering vents. Be sure to remove old form boards, grade stakes, etc., that was used during building construction. Remove old tree stumps and roots around and beneath the building. Most importantly, eliminate any wood on the building from contact with the soil. An 18-inch gap between the soil and wood portions of the building is ideal. It doesn’t hurt to routinely inspect the foundation of the building for signs of termite damage.” Additionally, the Insulating Concrete Form Association recommends soil treatment and re-treatment over the life of the building. Just because the structure is built of concrete does not mean that the termite will give up trying to get to its food source: wood! When using ICFs below-grade, the International Residential Code calls for chemical treatment of the soil and an approved method for protecting the foam. This can include chemical treatments fused into the ICF form, such as Perform Guard®, as well as physical barriers. 21. How energy-efficient are ICFs? Based on research performed by Building Works, Inc, houses built with ICF exterior walls require an estimated 44% less energy to heat and 32% less energy to cool than comparable wood-frame houses. A typical 2000 square foot home in the center of the U.S. will save approximately $200 in heating costs each year and $65 in air conditioning each year. The bigger the house the bigger the savings. In colder areas of the U.S. and Canada, heating savings will be more and cooling savings less. In hotter areas, heating savings will be less and cooling savings more. The energy efficient performance comes in large part from the polystyrene foam on the interior and exterior of ICF walls, which range from R-17 to R-26, compared to wood frame’s R-9 to R-15 walls. Also, ICF walls are tighter, reducing infiltration (air leakage) by 50% over wood-frame homes. 22. Are ICFs a green building material? Green building, or sustainability, is a method of designing and building the most high performance building or home inside and out by maximizing the benefits of building materials and resources. Energy, being one of the world’s most valuable resources ,is a leading criteria of green building. Given that ICFs are extremely energy efficient, ICFs can easily be incorporated into green building designs to maximize its performance. 23. What is LEED? How can ICFs be used in USGBC’s Leadership in Energy and Environmental Design (LEED) program? LEED was launched in an effort by the United States Green Building Council to develop a “consensus-based, market-driven rating system to accelerate the development and implementation of green building practices.” The program is not rigidly structured, i.e., not every project must meet identical requirements to qualify. The LEED rating system has five main credit categories: sustainable sites, water efficiency, energy and atmosphere, materials and resources, and indoor environmental quality. Each category is divided into credits. The program outlines the intent, requirements, technologies, and strategies for meeting each credit. Credits are broken down into individual points. Additional points can be earned for innovation and use of a LEED-accredited professional on the project team. There are five ways ICFs help when using the LEED rating system. In addition to the points you can achieve by using ICFs, there are others that can be used to maximize LEED ratings. To see a full list, please visit the US Green Building Council’s website at www.usgbc.org. 24. Are ICFs code approved? Yes. Every major code body in North America, including ICC and CCMC, has approved ICFs. Also, ICFs are listed as a prescriptive method of building in the International Residential Code and can be built to commercial design specification using the International Building Code. ICFs are also listed as a building system in the newest edition of the Canadian National Building Code. 25. Where can I buy ICFs? Most ICF brands are sold throughout North America. Please refer to the ICFA member search to find the individual representing the systems that you are interested at www.forms.org. Interested parties can search for manufacturers (ICFA Primary Members) or resellers of the form in your local area (ICFA Distributor Members).